Check out this new resource for artists of faith wanting to speak into the conversation about the creative arts and church. The last four decades of dialogue in the area of faith and the arts has been an exciting one. From Francis Schaeffer and Hans Rookmaaker to Rory Noland and Jeremy Begbie, the modern evangelical church has been slowly and surely reclaiming the arts in the church. While I don’t put myself next to those giants, I have been very fortunate to be a part of this dialogue over the last decade, where we’ve gone from the highly theological, historical, and philosophical to the very practical and personal. 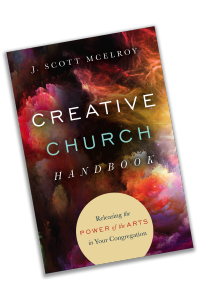 I’m excited to announce that my friend and colleague, J. Scott McElroy, has released a new book titled, “The Creative Church Handbook: Releasing the Power of the Arts in Your Congregation”(InterVarsity Press). I’m pretty serious when I say that this is a must-have for anyone who is a leader of artists of faith in the local church today.